This is such a spectacular Retro styled bracelet and necklace set that I was fortunate to obtain from an Old Stock Inventory. IT IS BRAND NEW in the BOX - the cover is missing however the contents are Pristine and Like New. Please note the pictures DO NOT do it justice and I am sure you will be thrilled with these lovely pieces. They are comprised of fancy , smooth, shiny links - they are rings joined together so doubled - and alternate between a bright yellow and rose gold hue, all similarly sized. The clasps are the original old spring bolt type in perfect working order with a thick jump ring soldered to the chain. Included is a chain extender to the necklace which adds about 7 cm to the length for two different looks tried it on and it looks great, so much so I am inclined to keep it. They have the silky smooth feel usually only associated with solid carat gold and expected of quality antique jewellery. Width: 1.9 cm or over 3/4"
Weight: a heavy 63 grams in total! MINT Vintage condition! This is a superb set that has never been worn - there is no wear, damage, flaws or repairs to note. 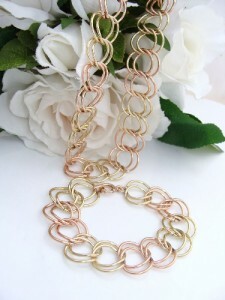 If you like those impressive, eye-catching pieces of jewellery then you will be thrilled with this. Perfect for lovers of Retro styling! What WOW factor it has!